Rick Otis, deputy associate administrator in the Office of Policy, Economics, and Innovation at the U.S. Environmental Protection Agency, kicked off the first Environmental Strategies Summit with a clear look at the agency's plans for the future. Otis was one of 12 experts presenting industry intelligence across the air, water, wastewater, wastes, and sustainability subject areas at Environmental Protection and Water & Wastewater News' foray into the event world. 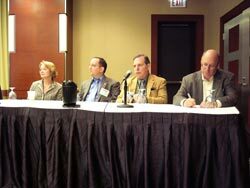 The meeting was held April 7-8 in Chicago. Noting that EPA is 36 years old, Otis told attendees that retirement is coming for some 300 senior executives in the agency. With their leaving will go some of the realization of how far environmental protection has progressed, he said. But that sentiment is not stopping the momentum the agency has built up recently. In the last 60 days, EPA has set particulate matter and nitrogen oxide standards for locomotive and marine diesel; established rules for lead renovation, repair, and painting programs; sought comments on a water program response to climate change; revised the ozone measure for the National Ambient Air Quality Standard; developed compensatory mitigation for losses of aquatic resources; and proposed aircraft drinking water standards. Otis said the agency will begin using the advanced notice of proposed rulemaking to engage affected industries before promulgating a new rule. "This should increase our transparency," he added. Claire Golden Lund, senior project manager at Sanborn, Head & Associates, Inc., gave attendees concrete examples of innovative technologies applied to remedial treatment systems and industrial pollution control. She noted that the trends in pollution control were heading toward regulations for greenhouse gas emissions, changes in feasibility studies/risk assessment, innovative approaches, and further energy reductions. EPA's Region 5 Spill Prevention, Control and Countermeasures (SPCC) Coordinator Barbara A. Carr, Ph.D., alerted attendees to the fact that the SPCC regulation will be revised in October. She provided detailed information on definitions and requirements and spent a good deal of her time responding to audience questions. The summit also provided expert insight into industrial wastewater pretreatment, stormwater management, hazardous waste remediation, green business practices, air pollution control advances as well as air emissions trading. Doug Scott, Illinois Environmental Protection Agency director, offered an overview of environmental improvements in Illinois, including cleaning up brownfields. Feedback from a survey of attendees was positive. "I thought the caliber of the speakers was very high -- and was glad to see federal EPA people there," wrote one. Another stated that "the speakers covered a lot of information in a short period of time and did a great job executing their technical information in an understandable manner."